Quartz the second most plentiful mineral present on the earth is indeed one of the finest too. Its consistent texture makes it one of the semi-precious gemstone present. There exist several varieties of this mineral all in different shapes and sizes and with some additional qualities. However, it should be kept in mind that everything natural will have some or the other small or big unimpressive quality about it, well just to remove that insignificant quality of quartz and for the transformation of this mineral into a world class product it is engineered with polymer resins to be then called as Silestone Quartz. Silestone Quartz which is it called is the synthetic material which is engineered from quartz and polymer resins out of which quartz constitutes more than 95 percent stone and the rest polymers. This addition of binding resins converts this into a highly resistant material whereas the existence of quartz makes this material very sturdy. Silestone Quartz is the only material which is essentially made up with the quality of bacteriostatic protection which gives this such hygienic properties that cannot be found elsewhere. The usage of this is very varied and immense. Silestone Quartz is indeed one of the best choices which are available in the market for various countertops, and vanity tops. Silestone Quartz is essentially the material which is most known for its durability and easy maintenance. The exceptional part about the Silestone Quartz is that it is very customizable since it can be blended with different colors easily thereby enhancing the overall options for the people. Quartz present in this makes it a non-porous and a scratch resistant material. These are manufactured in a way such that they are microbes-resistant and are very easy to clean. The natural beauty definitely adds some brownies points to it. 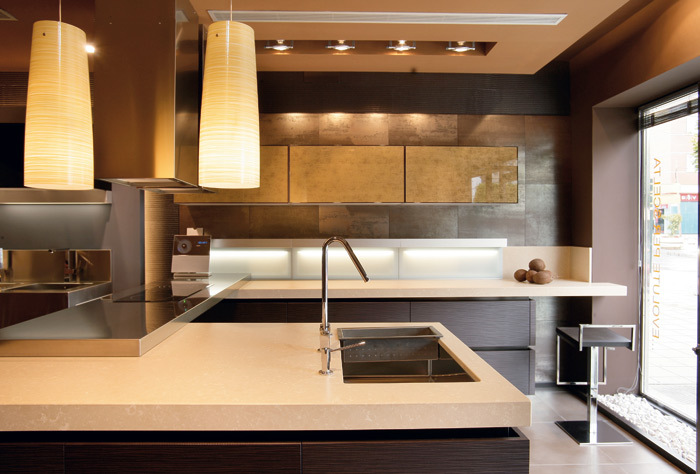 Silestone Quartz is maintenance free as it will not require sealing or polishing for a long duration of time. These are available at pretty affordable rates too for any countertops or worktops. This highly resistant material offers an amazing resale value too. This literally indestructible material cannot be scratched, burnt or stained and hence is an ideal choice for everyday usage. Another piece of information about these Silestone Quartz is that that their price per foot is usually less as compared to the other products of the same category which are available in the market. Awesome colors, great resistance, durability and sturdiness have made this material a gem in itself. The usage of such a material is immense and on a daily basis. Individuals looking for trendy designs for their homes can research about this since all these qualities of Silestone Quartz can only be found in very few.